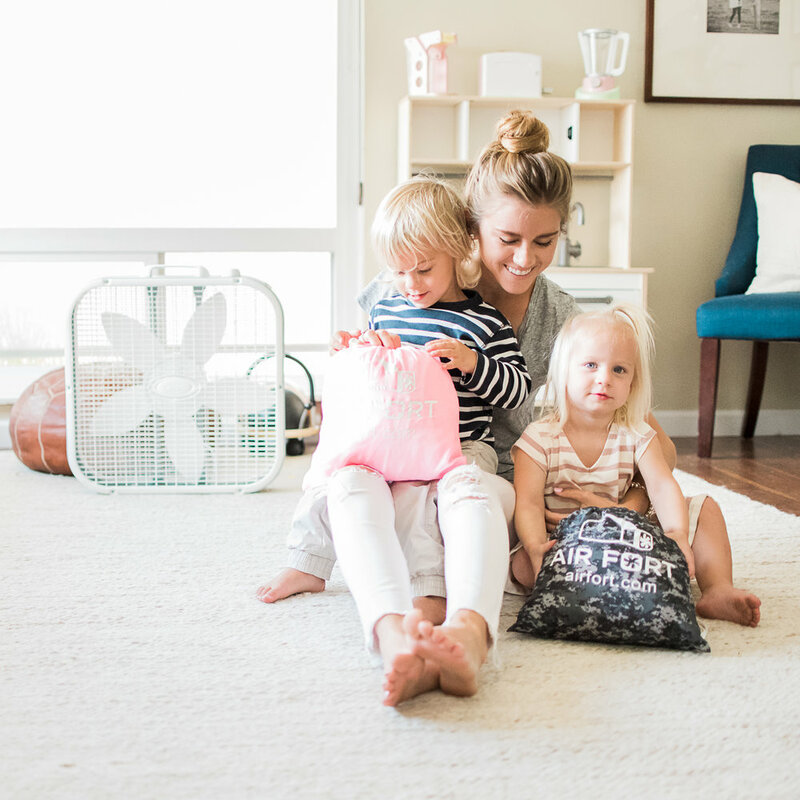 Without further ado, meet Luciana Hanley of the kids' toy company, AirFort. We got to ask Luciana some questions about how, when, and why she started her small biz! Here are her answers! At AirFort our mission is to create the greatest kids escape. When did you start AirFort? I started my business in 2015 with my dad/partner. My dad had the idea of the AirFort when he was in 6th grade after he was put on restriction for peeing in his neighbor's pool. When my sisters and I were little we were constantly building forts in the living room out of anything we could find around the house. Guess who was always cleaning them up? My parents! My dad one day decided to pull out my mom's old sewing machine and make us girls our very first AirFort. We freaked out over it! So did the rest of the neighborhood! In 2015, after graduating from the University of San Diego, my dad and I decided to partner up and bring our idea to life! We officially began selling AirForts January of 2017. YES!! Ever since I was little I was always working on my "little businesses". Very minor at the time, LOL, lemonade stands, garage sales, lotions made out of every old scented products I could find around the house... I was never a school person and was always so excited at the thought of starting my own company. I love being able to create and make my own path in life. No more fun way to do it then creating something you love and believe in! I think starting my own business has always been a part of me. Prior to starting AirFort, I had a few internships, my favorite one being for the Kardashians (they are incredible business people despite what it may look)! I am surrounded by a lot of strong, "go-getter" type women, including my mom and sister, and so I knew I had all the support I needed to go out and start my own business! Oh my gosh, I have learned SO many lessons on this journey!! I feel like I learn something new every day. I think the two biggest things I've learned are don't trust anyone (lots of sneaky snakes in the business world). Make sure you are doing something you believe in and passionate about! There are going to be a lot of great days but also a lot of not so great days. When you're doing something you love it makes all of the ups and downs worth every second of the hard work that was put into it. I think how well I connect with our customers is a big advantage! Whether it's through social media, emails, letters, etc. I have been able to connect with so many amazing customers. People are bombarded by so many products, services, and advertisements that being able to dig deeper than just selling a fun fort makes us stand out. I wish I was better at not being so emotionally attached to my business. A lot of people always say "don't get emotional about your business" blah, blah, blah... easy to say when you're not the one that's invested time, money, energy and multiple years of your life to it! It is definitely something I am working on getting better at everyday, but it's not easy! I definitely need to work on seperating my business from my personal life.I wish I was better at the accounting side of my business. Although I minored in accounting and have some background experience, I’ve never felt fully comfortable with that aspect of the business and know there is so much more that I could learn. Being a father-daughter team. So many of our customers are able to connect with our story which is so fun to see. Also, having a product that really lets kids go into their own little worlds and use their imaginations is extra special. Kids are able to take an ordinary household product (a fan) and create something so cool in just seconds. Being in the toy industry, there are products that have been around since our parents were little. It's so cool to see new products entering into the market but also having traditional products that have been sold forever still be a big hit. I think the toy industry will continue to grow especially with technology making such an impact on younger kids lives these days. Ready to get your small biz idea off the ground like Luciana? Newer PostHow to Start a Biz: FREE GIVEAWAY! Older PostLLC, Corporation, or S Corporation? Choosing the Right Entity for Your Biz.